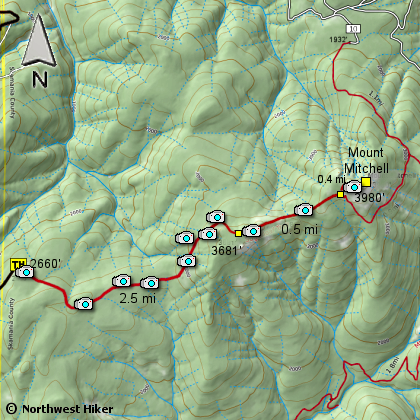 With the original trail to Mount Mitchell no longer accessible, a resourceful hike enthusiast managed to revive an abandoned trail to the rewarding summit of Mount Mitchell. Because this is a non-maintained trail, it is recommended for the more experienced hikers as trail following is sometimes sketchy. Also it is recommended that this hike be done with hiking poles due to the first ultra steep section of the trail. From the parking lot, the hike begins up an abandoned 4WD road, but quickly turns into a crude super steep scramble up the hillside. Don't worry however, the steep part does not last long and then heads east into the forest. The trail will alternate between lush areas and drier pine areas. There are some newer trail flags and old red blazes along much of the trail. The the trail from here is in surprisingly good condition until you come upon a boulder field at the foot of towering basalt wall, the bottom of Sugarloaf Mountain. This too looks intimadating at first, but the trail picks its way through the rocks along the wall’s base. 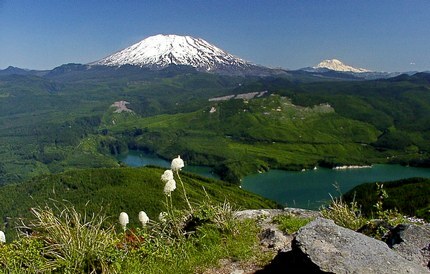 There are great views of Mount St. Helens in this section on a clear day and some flowers in season. Shortly after leaving the rock wall the trail joins up with the Sugarloaf Trail. Hike east 0.5 miles to reach the junction with the Mt. Mitchell trail, and then up the final 0.4 miles to the summit. When you break out onto the top of this peak, you will be rewarded with spectacular view and unique rock scupltures. Needless to say, this hike is a real gem. Drive to Cougar, Washington and make a note of an odometer reading. Drive east for 3.9 miles on the Lewis River Road (503), which becomes Forest Road 90, until it intersects Forest Road 10 (N46 03.320, W122 14.873). Make an extreme right turn onto FR10 and follow it (S-6000) for about 0.8 miles and you will see a logging road turn off to the right (N46 03.068, W122 14.873). Drive up this main road as it gains elevation. At the summit you will pass through a logged area, then head straight down the other side (bearing left.) At about 6.25 miles look for an acute left turn (N46 00.298, W122 15.623). Turn left and follow this one lane road about 1.9 miles until the road ends at a small parking area, though no signs indicate that this is the trailhead. You begin the hike by walking uphill on an abandoned 4WD road which quickly turns into a trail. Note: Driving to this trailhead requires preparation. One should not rely on electronic resources as the route they may take you is not correct or the most direct, and the road used may not be known to the database. It is best to print a detailed map of the final eight miles of the drive before leaving home.